AgroAtlas - Weeds - Cenchrus pauciflorus L. - Coastal sandbur. Cenchrus pauciflorus L. - Coastal sandbur. Family Poaceae (Graminea), Genus Bromus. Stems are thick, flattened, half-raised, 20-60 cm in height, well-foliated, developing roots in nodes. Inflorescence is spike-like panicle, consisting of 8-15 brown or yellow-green spikelets. 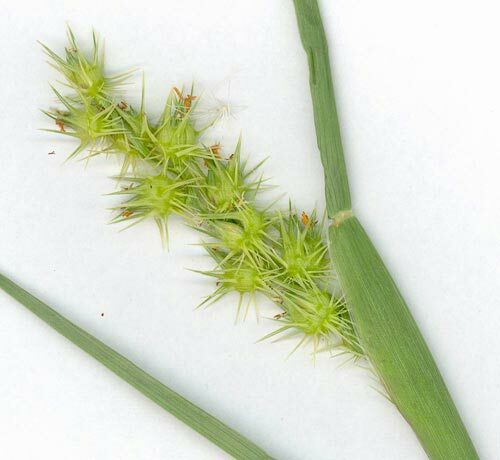 Spikelets are 4-7 mm in length, wrapped in prickly scales. Caryopsis is black-brown or green-yellow. Germination occurs in the middle of May. Ripening is in July-August. Productivity depends on habitat conditions. On pastures with compressed soil plants are stunted and produce 10-15 seeds. In tilled, cucurbitaceous and vegetable crops this weed grows well, and every plant produces up to 1000 seeds. Seed germination 1-1.5 months after harvesting is 47%, in 2-3 months it is 86%. Optimum temperature of germination is 20-25°C. This plant is drought-resistant and requires high light. Seeds germinate from a depth of 20 cm. This weed is adventitious (from America) in Kherson and Dnepropetrovsk regions of Ukraine. This weed prefers sandy and sandy-loam soils in arid steppes. This is one of the factors limiting its area. This is highly pernicious quarantine weed, which sharply reduces yield. It infests corn, sunflower, vegetable and cucurbitaceous crops, and also vineyards. This weed is severe in watermelons, because its control by cultivation is only possible before stem formation, after that weeding is impossible. Weed infestation can reach up to 300 plants per square meter. Coastal sandbur harms sheep farming, because prickly seeds cling to the sheep wool and sharply reduce its quality. When eaten by sheep , they damage mucosa and cause ulcers and tumors. Control measures: deep plowing, using winter wheat in crop rotation, because it suppress weed growth, methods of quarantine limiting the distribution of coastal sandbur, chemical control in crops, in non-cultivated lands - flaming. Fisyunov A.V. 1973. Dangerous weed. Zashchita rastenyi N.7: 45-46. Moskalenko G.P., Kudryavtseva A.N. 1988. Weed control in cropping practice. Moscow: Agropromizdat. 206-212 pp. Ulyanova T.N. 1998. Weeds in the flora of Russia and other FSU states. Saint Petersburg: VIR. 343 pp.